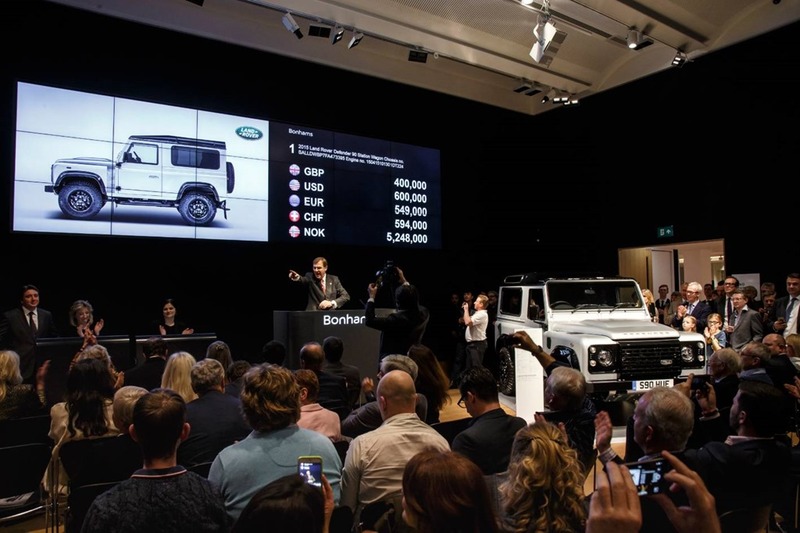 London, UK, December 16, 2015 – A one-of-a-kind Land Rover Defender sold for a record £400,000 at a prestigious charity auction at Bonhams tonight, from which all proceeds are being donated to Land Rover’s humanitarian and conservation partners. This is the thought to be the most valuable production Land Rover ever to be sold at auction. The vehicle, built as part of a year of celebrations for the much loved 4×4 which will cease manufacturing in Solihull in January 2016, boasts a host of distinctive and bespoke finishing features including an engraved map of Red Wharf Bay – where the design for the original Land Rover was first drawn in the sand, and a unique ‘no 2,000,000’ badge. Inside, the leather seats also feature the ‘Red Wharf Bay’ graphic and ‘no 2,000,000’ logos have been stitched on the headrests. A bespoke aluminium plaque, signed by everyone who helped to assemble the vehicle is fitted to the driver’s seat. Special S90 HUE registration plates provide a fitting tribute to the first ever pre-production Land Rover, registration ‘HUE 166’.